Browse Artists and Groups John A. Hammond, LL.D, R.C.A., O.S.A. 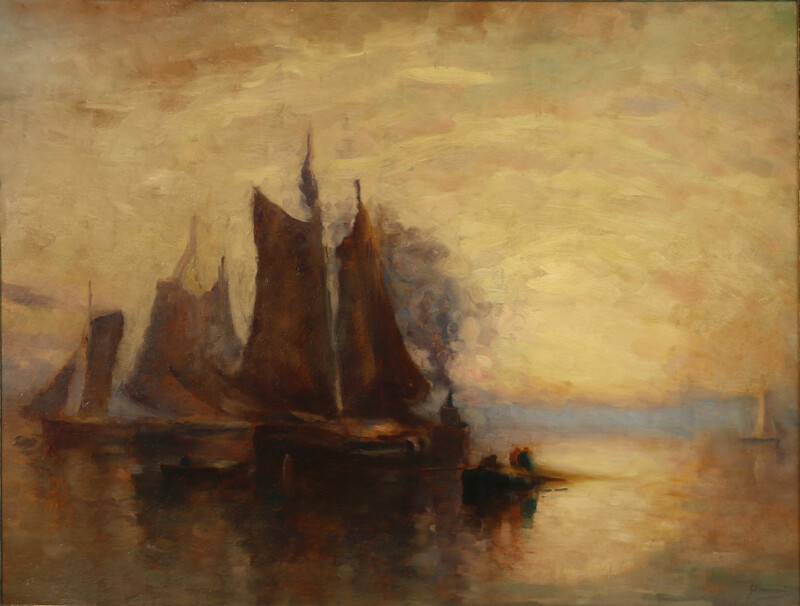 "A great admirer of the painters of the French Barbizon and Dutch Hague schools, Canadian painter John Hammond was best known for his landscapes and marines (or paysages de mer - landscapes of the sea) depicting the Bay of Fundy. Hammond was born in Montreal. By the age of nine, he was working with his father as a marble cutter. In 1866, he travelled with his brother to England and New Zealand to prospect for gold. En route, he became a member of the Plymouth Brethren. While travelling, Hammond noted that the scenery was "magnificent" but that the prospecting was not. Upon his return to Montreal in 1870, he began working for the Notman Studio. He travelled to British Columbia with the Transcontinental Railway Survey in 1871 and seven years later set up a Notman studio in Saint John, New Brunswick. There he became the principal of the Owens Art Institution. It was subsequently moved to Mount Allison Ladies College in Sackville in 1893, where Hammond lived for the rest of his life. Although in the 1880s, he sketched in Europe, his primary inspiration came from the landscape of New Brunswick, as seen in works such as Herring Fishing, Bay of Fundy (1894). Admired by Sir William Van Horne, Hammond painted for the Canadian Pacific Railway in the Rockies in 1892. His painting, Canton, China (1900), was done during a 1900-1901 visit to China and Japan to promote the company's steamship line. Hammond was an elected member of the Royal Canadian Academy of Arts." Please send me more details about the following artist. John A. Hammond, LL.D, R.C.A., O.S.A. titled, inscribed and signed in pencil, "Fishing Boats / Bay of Fundy / $300 / J Hammond (verso, upper right).